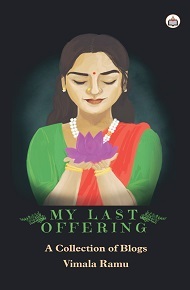 My Last Offering is Vimala Ramu's 7th publication. True to her reputation as a humorous blogger, this book has 54 blogs, based on her personal and varied experiences in her rich life expressed in her unique style. Vimala Ramu is a popular blogger whose blogs have appeared in Deccan Herald, magazines, e-magazines and on various websites. She has compiled her blogs into books – Rainsong, Dew Drops, Wind Chimes, Colors – and published a novella And She Waited Sixty Years. Her books have been made into audio CDs for the visually challenged by Mitrajyoti of Bengaluru. Through My Bloggled Eyes is her 6th publication in print, the e-version of which is already available on Amazon along with e-versions of her other books. Humour is her forte. She continues to blog on www.wordpress.com.